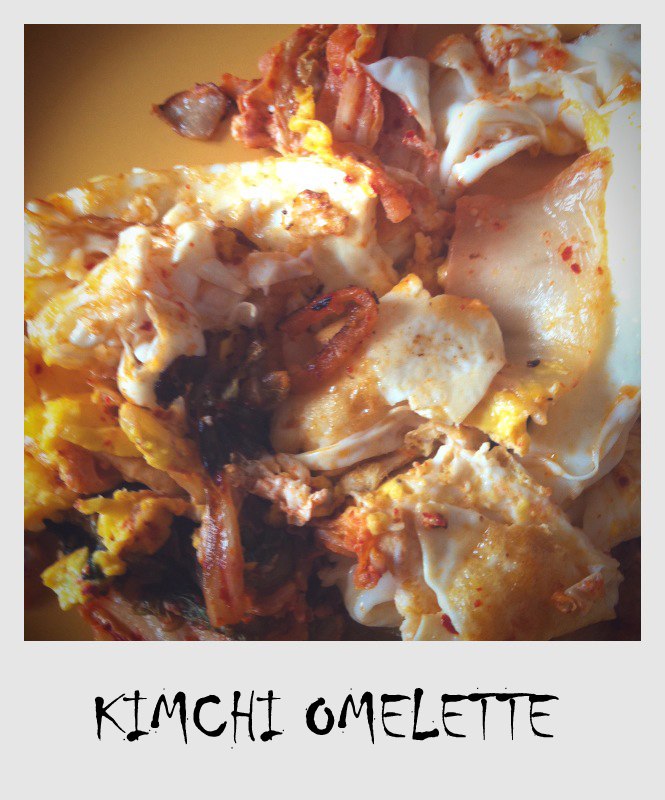 My friend Yehua started incorporating kimchi into her everyday food (and I do mean everyday). I like to think that I contributed to her fascination when I made us ramen with kimchi and a fried egg…which Angela made me went I went home with her for Thanksgiving…yeah, kimchi for Thanksgiving…you wanna take it outside? All of these fateful events led to one of the easiest, quickest and most flavorful omelettes I’ve made to date…and I don’t want to toot my own horn or anything, but I’m pretty skilled when it comes to eggs…you can even call me an eggpert (yes, I know, it wasn’t funny when I first said it here, and it’s still not). If you don’t like kimchi, then you’re a prude. Yup, I said it! And if you got all huffy because of my comment, then I don’t even know how we became friends in the first place!